The Grateful Dead set up two record labels after leaving Warner Brothers in 1973; Grateful Dead Records for group recordings and Round Records for solo projects. Round Records was owned by Jerry Garcia and Ron Rakow. At the end of 1975 the group abandoned some of their independence and signed a distribution deal with United Artists. After this time albums were released with both Round Records catalog numbers and United Artists numbers. The Dead however retained rights to their recordings of this period and they subsequently became available through Grateful Dead Merchandising. The labels were wound up in 1976 and the Dead signed with Arista. The first Round Records LP and Robert Hunter's first solo LP. This LP was released in June 1974. Jerry Garcia, Mickey Hart and Keith and Donna Godchaux play on the album. The second Jerry Garcia solo LP, released in June 1974. This album was titled simply Garcia (as was the 1972 solo Garcia LP). It became known as Compliments Of Garcia as the word "compliments" was printed above the title on early, complimentary copies of the LP. An expanded version was included in the All Good Things box set in 2004 and then released as an individual CD in 2005. The only Old & In The Way album until archive releases in 1997. This LP was released in February 1975. Features live recordings from the Boarding House in San Francisco in October 1973. The only Keith and Donna Godchaux album. This LP was released in March 1975. Jerry Garcia plays on the album which was mostly recorded at the Godchauxs house in Stinson Beach. The second Robert Hunter solo LP. Jerry Garcia, Mickey Hart and Donna Jean Godchaux play on the album which was produced by Garcia. 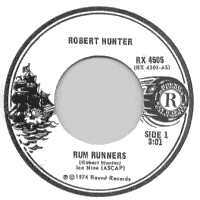 Robert Hunter re-recorded the vocals in 1988 for a re-release of the album. The second Robert Hunter solo LP. Jerry Garcia, Mickey Hart and Phil Lesh play on this album of experimental electronics which was released in April 1975. The third Jerry Garcia solo LP, released in February 1976. All members of the Grateful Dead contribute to this album. An expanded version of Reflections was included in the All Good Things box set in 2004 and then released as an individual CD in 2005. The first Kingfish LP. Recorded and released (in March 1976) when Bob Weir was a member of the group. This bluegrass album was produced by Garcia. It is the only Round Records release that does not include a major performing role from a member of the Grateful Dead. A percussion based album from Mickey Hart and friends. Jerry Garcia plays guitar on two tracks. A 6 CD box set that includes the expanded remastered reissues of the two Jerry Garcia albums released on Round Records. In total the box set includes 4 hours of previously unreleased studio material and is accompanied by a 100 page book that includes a foreword by Robert Hunter.